Succinylcholine et frigo: Non fondé ? Gammon DL, et al (2008) Alteration in prehospital drug concentration after thermal exposure. Am J Emerg Med 26:566–73. Agence Nationale de Sécurité du Médicament et des Produits de Santé (2013) Enquête officielle de pharmacovigilance relative aux réactions anaphylactiques liées à l’utilisation des curares. 21 mai 2013. In their paper on airway management in cervical spine injury , focusing on videolaryngoscopy, Duggan and Griesdale mention characteristics that predispose to failure of videolaryngoscopy, including anatomical abnormality, local scarring, radiotherapy, and airway masses. An additional factor worth considering, especially in the context of trauma, is the impact of oropharyngeal blood on the videolaryngoscopic view, which can obscure the larynx or camera lens and obstruct the light source, reducing illumination. Recent personal experiences with a McGrath MAC videolaryngoscope (Aircraft Medical, Edinburgh, UK) found that dried blood lining the oropharynx reduced reﬂection, producing a dull on-screen image, requiring conversion to direct laryngosc opy. It seems likely that videolaryngoscopy will replace direct laryngoscopy as the standard method of intubation, but the auth ors are correct in saying it will remain necessary to maintain ski lls in both techniques. The effect of laryngoscope handle size on possible endotracheal intubation success in university football, ice hockey, and soccer players. Un laryngoscope avec un manche court serait plus facile à utiliser. On rappelle que le laryngodcope truphatek dispose d'un manche court. To assess the effectiveness of a standard long-handle laryngoscope and a short-handle laryngoscope on ease of possible intubation in football, ice hockey, and soccer players. Sixty-two university varsity football (62 males), 45 ice hockey (26 males and 19 females), and 39 soccer players (20 males, 19 females). Athletes were assessed for different airway and physical characteristics. Three different physicians then assessed the use of laryngoscopes of different handle sizes in supine athletes who were wearing protective equipment while in-line cervical spine immobilization was maintained. The ease of passage of a laryngoscope blade into the posterior oropharynx of a supine athlete was assessed using both a standard long-handle and a short-handle laryngoscope. Use of a short-handle laryngoscope was easier for all physicians in all sports as compared with a standard-sized laryngoscope. Passage of a laryngoscope blade into the posterior oropharynx of a supine athlete was easiest in soccer players and most difficult in football and ice hockey players for both sizes of laryngoscope. Interference from chest or shoulder pads was a common cause for difficulty in passing the laryngoscope blade into the posterior oropharynx for football and ice hockey players. In the rare instances that an endotracheal intubation is to be attempted on an unconscious athlete, a short-handle laryngoscope may provide the best chance for successful intubation. En France les seuls infirmiers à intuber sont les IADE. Pourtant dans le reste du monde d'autres catégories de personnels de santé non médecins le pratiquent. Les EMT communément appelés paramedic sont formés et réalisent ce geste en préhopsitalier. Il existe maintenant suffisamment de littérature pour pouvoir dire que cette pratique est valide avec bien sûr la nécessité d'une formation adaptée. C'est que rapporte ce document qui n'est pas le seul. Endotracheal intubation success rates in the prehospital setting are variable. Our objective was to describe the challenges encountered and corrective actions taken during the process of endotracheal intubation by paramedics. Analysis of prehospital airway management using a prospective registry that was linked to an emergency medical services administrative database. Emergency medical services system serving King County, Washington, 2006-2011. Paramedics in this system have the capability to administer neuromuscular blocking agents to facilitate intubation (i.e., rapid sequence intubation). A total of 7,523 patients more than 12 years old in whom paramedics attempted prehospital endotracheal intubation. An intubation attempt was defined as the introduction of the laryngoscope into the patient's mouth, and the attempt concluded when the laryngoscope was removed from the mouth. Endotracheal intubation was successful on the first attempt in 77% and ultimately successful in 99% of patients (7,433 of 7,523). 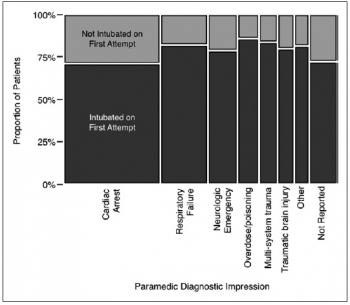 Paramedics used a rapid sequence intubation strategy on 54% of first attempts. Among the subset with a failed first attempt (n = 1,715), bodily fluids obstructing the laryngeal view (50%), obesity (28%), patient positioning (17%), and facial or spinal trauma (6%) were identified as challenges to intubation. 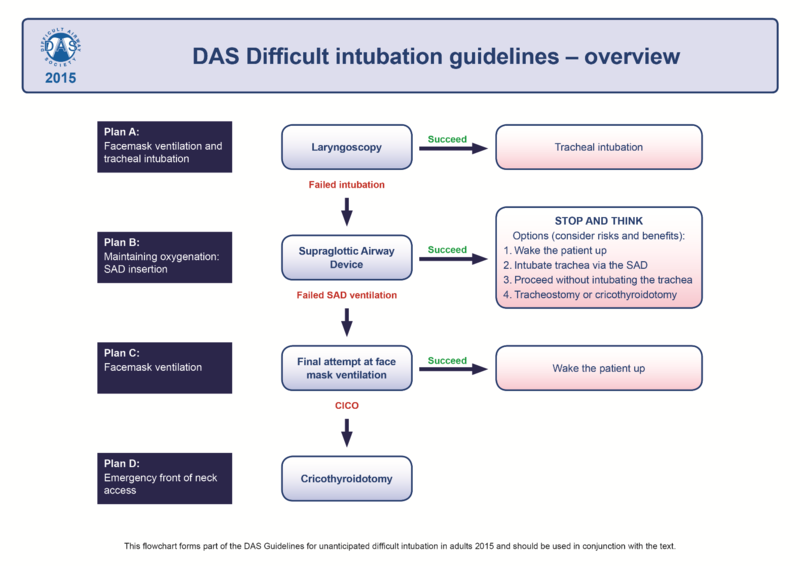 A variety of adjustments were made to achieve intubation success, including upper airway suctioning (used in 43% of attempts resulting in success), patient repositioning (38%), rescue bougie use (19%), operator change (16%), and rescue rapid sequence intubation (6%). Surgical cricothyrotomy (0.4%, n = 27) and bag-valve-mask ventilation (0.8%, n = 60) were rarely performed by paramedics as final rescue airway strategies. Airway management in the prehospital setting has substantial challenges. Success can require a collection of adjustments that involve equipment, personnel, and medication often in a simultaneous fashion. Mc Queen C et Al. Emerg Med J. 2015 Jan;32(1):65-9. In the West Midlands region of the UK, delivery of pre-hospital care has been remodelled through introduction of a 24 h Medical Emergency Response Incident Team (MERIT). Teams including physicians and critical care paramedics (CCP) are deployed to incidents on land-based and helicopter-based platforms. Clinical practice, including delivery of rapid sequence induction of anaesthesia (RSI), is underpinned by standard operating procedures (SOP). This study describes the first 12 months experience of prehospital RSI in the MERIT scheme in the West Midlands. Retrospective review of the MERIT clinical database for the 12 months following the launch of the scheme. Data was collected relating to the number of RSIs performed; indication for RSI; number of intubation attempts; grade of view on laryngoscopy and the base speciality/grade of the operator performing intubation. MERIT teams were activated 1619 times, attending scene in 1029 cases. RSI was performed 142 times (13.80% of scene attendances). There was one recorded case of failure to intubate requiring insertion of a supraglottic airway device (0.70%). In over a third of RSI cases, CCPs performed laryngoscopy and intubation (n=53, 37.32%). Proficiency of obtaining Grade I view at laryngoscopy was similar for physicians (74.70%) and CCPs (77.36%). Intubation was successful at the first attempt in over 90% of cases. This study demonstrates that operation within a system that provides high levels of exposure, underpinned by comprehensive and robust training and governance frameworks, promotes levels of performance in successful prehospital RSI regardless of base speciality or profession. Vidéolaryngoscopie: Oui au moins dans les hélico ! Les conditions d'intubations lors d'un transport hélico peuvent nécessiter une intubation face à face. Bien que discuté, dans de telles conditions l'apport d'un vidéolaryngoscope est utile. Les pararescue US font la même analyse. 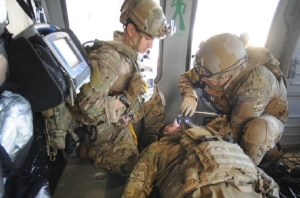 This article highlights recent advances made in U.S. Air Force Pararescue Medical Operations in relation to tactical evacuation procedures. Most of these changes have been adopted and adapted from civilian medicine practice, and some have come from shared experiences with partner nations. Patient assessment includes a more comprehensive evaluation for hemorrhage and indications for hemorrhagic control. Ketamine has replaced morphine and fentanyl as the primary sedative used during rapid sequence intubation and procedural sedation. There has been an increasing use of the bougie to clear an airway or nasal cavity that becomes packed with debris. Video laryngoscopy provides advantages over direct laryngoscopy, especially in situations where there are environmental constraints such as the back of a Pave Hawk helicopter. Intraosseous access has become popular to treat and control hemorrhagic shock when peripheral intravenous access is impractical or impossible. Revisions to patient treatment cards have improved the efficacy and compliance of documentation and have made patient handoff more efficient. These improvements have only been possible because of the concerted efforts of U.S. Air Force and partner platforms operating in Afghanistan. La mâchoire en avant: Mieux pour intuber ! Améliorer la vue laryngée pet se faire avec des moyens simples comme la manoeuvre BURP. C'est encore mieux si on associe la protusion mandibulaire. Background: When oral or nasal fiberoptic laryngoscopy is attempted, mandibular advancement has been reported to improve the laryngeal view. The authors hypothesized that mandibular advancement may also improve the laryngeal view during direct laryngoscopy. Methods: Forty patients undergoing elective surgery under general anesthesia were included in this study. After establishment of an adequate level of anesthesia and muscle relaxation, direct laryngoscopy was performed by inexperienced physicians. Four different maneuvers—simple direct laryngoscopy without any assistance (C), simple direct laryngoscopy with mandibular advancement (M), simple direct laryngoscopy with the BURP maneuver (backward, upward, rightward pressure maneuver of the larynx; B), and simple direct laryngoscopy with both mandibular advancement and the BURP maneuver (BM)—were attempted in each subject, and the laryngeal aperture was videotaped with each procedure. An instructor in anesthesiology who was blinded to the procedure evaluated the visualization by reviewing videotape off-line, using the Cormack-Lehane classification system (grades I–IV) and a rating score within each subject (1  best view; 4  poorest view). The Friedman test followed by the Student-Newman-Keuls test was performed for statistical comparison. P < 0.05 was considered significant. Results: The laryngeal view was improved with M and B when compared with C (P < 0.05 by both rating and Cormack-Lehane evaluation). BM was the most effective method to visualize the laryngeal aperture (P < 0.05, vs. B and M by rating evaluation), whereas B and M were the second and the third most effective methods, respectively. No statistical difference was observed between B and M with the Cormack-Lehane classification. Conclusion: Mandibular advancement improves the laryngeal view during direct laryngoscopy performed by inexperienced physicians. Prehospital and en route cricothyrotomy performed in the combat setting: a prospective, multicenter, observational study. Airway compromise is the third most common cause of potentially preventable combat death. Surgical cricothyrotomy is an infrequently performed but lifesaving airway intervention. There are limited published data on prehospital cricothyrotomy in civilian or military settings. Our aim was to prospectively describe the survival rate and complications associated with cricothyrotomy performed in the military prehospital and en route setting. The Life-Saving Intervention (LSI) study is a prospective, institutional review board-approved, multicenter trial examining LSIs performed in the prehospital combat setting. We prospectively recorded LSIs performed on patients in theater who were transported to six combat hospitals. Trained site investigators evaluated patients on arrival and recorded demographics, vital signs, and LSIs performed. LSIs were predefined and include cricothyrotomies, chest tubes, intubations, tourniquets, and other procedures. From the large dataset, we analyzed patients who had a cricothyrotomy performed. Hospital outcomes were cross-referenced from the Department of Defense Trauma Registry. Descriptive statistics or Wilcoxon test (nonparametric) were used for data comparisons; statistical significance was set at p <.05. The primary outcome was success of prehospital and en route cricothyrotomy. Of the 1,927 patients enrolled, 34 patients had a cricothyrotomy performed (1.8%). Median age was 24 years (interquartile range [IQR]: 22.5-25 years), 97% were men. Mechanisms of injury were blast (79%), penetrating (18%), and blunt force (3%), and 83% had major head, face, or neck injuries. Median Glasgow Coma Scale score (GCS) was 3 (IQR: 3?7.5) and four patients had GCS higher than 8. Cricothyrotomy was successful in 82% of cases. Reasons for failure included left main stem intubation (n = 1), subcutaneous passage (n = 1), and unsuccessful attempt (n = 4). Five patients had a prehospital basic airway intervention. Unsuccessful endotracheal intubation preceded 15% of cricothyrotomies. Of the 24 patients who had the provider type recorded, six had a cricothyrotomy by a combat medic (pre-evacuation), and 18 by an evacuation helicopter medic. Combat-hospital outcome data were available for 26 patients, 13 (50%) of whom survived to discharge. The cricothyrotomy patients had more LSIs than noncricothyrotomy patients (four versus two LSIs per patient; p <.0011). In our prospective, multicenter study evaluating cricothyrotomy in combat, procedural success was higher than previously reported. In addition, the majority of cricothyrotomies were performed by the evacuation helicopter medic rather than the prehospital combat medic. Prehospital military medics should receive training in decision making and be provided with adjuncts to facilitate this lifesaving procedure. Gonflez le ballonnet à l'eau et échographiez le au niveau de la fourchette sternale ! On parle beaucoup de l'apport de l'échographie en préhospitalier et plus particulièrement de l'échographie des voies aériennes. Ce travail réalisé dans un contexte de pédiatrie hospitalière est intéressant car il peut peut-être être transposé à nos besoins. 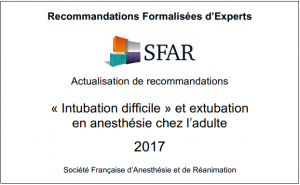 Etre rapidement certain du caractère effectif de l'intubation peut être difficile. L'échographie peut être d'un apport important par la visualisation d'un glissement pleural bilatéral. On peut aussi gonfler le ballonnet de la sonde [Ce qui est fait lors de transports aériens non ou mal préssurisés], ce qui permettra d'observer non un cône d'ombre en arriere du ballonnet mais les structures anatomiques du fait de la transmissions des ondes permise par l'eau présente dans le ballonnet. We evaluated the accuracy of tracheal ultrasonography of a saline-inflated endotracheal tube (ETT) cuff for confirming correct ETT insertion depth. We performed a prospective feasibility study of children undergoing endotracheal intubation for surgery. Tracheal ultrasonography at the suprasternal notch was performed during transient endobronchial intubation and inflation of the cuff with saline, and with the ETT at a correct endotracheal position. Ultrasound videos were recorded at both positions, which were confirmed by fiberoptic bronchoscopy. These videos were shown to two independent blinded reviewers, who determined the presence or absence of a saline-inflated cuff. The primary outcome was accuracy of tracheal ultrasonography for appropriate ETT insertion depth. Forty-two patients were enrolled. For correct endotracheal versus endobronchial positioning, pooled results from the reviewers revealed a sensitivity of 98.8% (95% CI=90-100%), a specificity of 96.4% (95% CI=87-100%), a PPV of 96.5% (95% CI=87-100%), a NPV of 98.8% (95% CI=89-100%), a positive likelihood ratio of 32 (95% CI=6-185), and a negative likelihood ratio of 0.015 (95% CI=0.004-0.2). Agreement between reviewers was high (kappa co-efficient=0.93; 95% CI=0.86 to 1). The mean duration of the ultrasound exam was 4.0s (range 1.0-15.0s). Sonographic visualization of a saline-inflated ETT cuff at the suprasternal notch is an accurate and rapid method for confirming correct ETT insertion depth in children. Brown CA et Al. Ann Emerg Med. 2014;-:1-9. Une certitude, l'emploi de vidéolaryngoscope simplifie l'abord trachéal pour les praticiens les moins expérimentés. Reste à démocratiser au plan économique ces dispositifs. Study objective: We describe the operators, techniques, success, and adverse event rates of adult emergency department (ED) intubation through multicenter prospective surveillance. Methods: Eighteen EDs in the United States, Canada, and Australia recorded intubation data onto a Web-based data collection tool, with a greater than or equal to 90% reporting compliance requirement. We report proportions with binomial 95% confidence intervals (CIs) and regression, with year as the dependent variable, to model change over time. Results: Of 18 participating centers, 5 were excluded for failing to meet compliance standards. From the remaining 13 centers, we report data on 17,583 emergency intubations of patients aged 15 years or older from 2002 to 2012. Indications were medical in 65% of patients and trauma in 31%. Rapid sequence intubation was the first method attempted in 85% of encounters. Emergency physicians managed 95% of intubations and most (79%) were physician trainees. 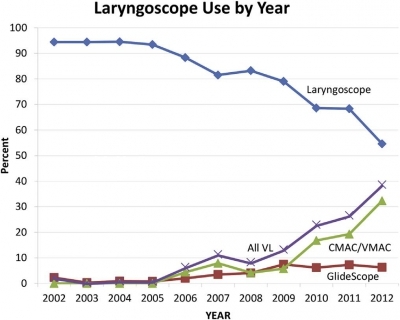 Direct laryngoscopy was used in 84% of first attempts. Video laryngoscopy use increased from less than 1% in the first 3 years to 27% in the last 3 years (risk difference 27%; 95% CI 25% to 28%; mean odds ratio increase per year [ie, slope] 1.7; 95% CI 1.6 to 1.8). Etomidate was used in 91% and succinylcholine in 75% of rapid sequence intubations. Among rapid sequence intubations, rocuronium use increased from 8.2% in the first 3 years to 42% in the last 3 years (mean odds ratio increase per year 1.3; 95% CI 1.3 to 1.3). The first-attempt intubation success rate was 83% (95% CI 83% to 84%) and was higher in the last 3 years than in the first 3 (86% versus 80%; risk difference 6.2%; 95% CI 4.2% to 7.8%). The airway was successfully secured in 99.4% of encounters (95% CI 99.3% to 99.6%). Conclusion: In the EDs we studied, emergency intubation has a high and increasing success rate. Both drug and device selection evolved significantly during the study period. Plus d'auscultation mais une Echo ? Point of care ultrasound for orotracheal tube placement assessment in out-of hospital setting. A lire cet article, on comprend pourquoi l'engouement actuel pour l'échographie des voies aériennes. A coup sûr une technique à maîtriser en préhospitalier. The percentage of unrecognised orotracheal tube displacement in an out-of-hospital setting has been reported to be between 4.8% and 25%. The aim of our study was to assess the sensitivity and specificity of Point-of-Care-UltraSound (POCUS) for confirming the propertube position after an urgent orotracheal intubation in an out-of-hospital setting and the time needed for POCUS. Our single-centred prospective study included all patients who needed out-of-hospital orotracheal intubation. After the intubation, bilateral chest auscultation and assessment of bilateral lung sliding and diaphragm excursion within POCUS were done. Spectrographic quantitative capnography was used as the reference standard to confirm a proper tube position. We enrolled 124 patients. For auscultation, sensitivity and negative predicted value were 100%, specificity was 90% and positive predicted value 30% (95% confidence interval). Sensitivity, specificity, positive predicted value, and negative predicted value for POCUS alone and for a combination of auscultation and POCUS were 100% (95% confidence interval). In three patients, we detected endobronchial tube displacement with auscultation and POCUS. Capnography failed to detect displacement in all three cases. The median time needed for POCUS was 30s. Results of our study support POCUS as an accurate and reliable method for confirming the proper orotracheal tube placement in trachea and it is feasible for out-of-hospital setting implementation. POCUS also seems to be time saving method but to make definitive conclusion more studies should be done. Une bougie dans la sonde: c'est mieux. Study Objectives: We sought to evaluate the success rate and time to endotracheal intubation by emergency medicine residents with stylet reinforced endotracheal tube (ETT-S) versus intubation with a gum elastic bougie (GEB) in simulated easy and difficult airways on a cadaveric model. Methods: The study was a prospective cross-over design using a single study cohort of 29 emergency medicine residents. A fresh frozen cadaver was used in either standard positioning to facilitate a Cormack Lehane Grade 1 laryngoscopy, or with a hard cervical collar applied a Cormack Lehane Grade 3 laryngoscopy. Each participant then intubated the cadaver in each setting (Grade 1 ETT-S, Grade 1 GEB, Grade 3 ETT-S, Grade 3 GEB). The primary end-point of our investigation was the time to intubation. Secondary endpoints were: success rate of intubation, mean ratings by study participants of perceived ease of intubation for each intubation technique in each simulated degree of difficulty, and overall preference of intubation technique in each simulated degree of difficulty. To assess the effect of intubation type (GEB vs ETT-S) and difficulty on time to successful intubation and perceived ease of intubation, repeated measures ANOVAs were conducted. To examine whether success of intubation differed across the GEB and ETT-S groups we used a McNemar’s test. To examine the effect of previous experience on time to intubation, we used a mixed model ANOVA incorporating intubation type and difficulty of intubation. Results: Mean time to intubation in all scenarios ranged from 28.8 – 116.6 seconds. Year of residency training trended toward significance but was not significant when comparing post-graduate year to time to intubation (p¼ 0.07). Time to intubation was significantly different only when comparing Grade 3 ETTS to Grade 3 GEB (p¼ 0.006). Of the 116 intubations performed in this study, a total of 36 were failed attempts. There was no significant difference in success rate when comparing Grade 1 ETT-S to Grade 1 GEB nor Grade 3 ETT-S to Grade 3 GEB (p ¼ >0.05). Across all year groups, participants perceived the Grade 1 scenario to be easier than the Grade 3 scenario. At the conclusions of the study, 55% of participants preferred using the GEB in all settings. When broken down by scenario, 41% preferred the GEB in the Grade 1 scenario while 76% preferred the GEB in the Grade 3 scenario. Conclusions: Time to intubation in a simulated grade 3 view was significantly longer in the GEB group versus the ETT-S group. Although the differences in success rates were not statistically significant, there was a trend toward more successful intubations with the GEB in the simulated grade 3 view. This is important because in the emergency department when difficult airways can be high stress and life threatening, although the GEB group took more time, the success rates were higher. Jacobs PE et all. Int J Crit Illn Inj Sci. 2014 Jan-Mar; 4(1): 57–64. Prehospital airway management is a key component of emergency responders and remains an important task of Emergency Medical Service (EMS) systems worldwide. The most advanced airway management techniques involving placement of oropharyngeal airways such as the Laryngeal Mask Airway or endotracheal tube. Endotracheal tube placement success is a common measure of out-of-hospital airway management quality. Regional variation in regard to training, education, and procedural exposure may be the major contributor to the findings in success and patient outcome. In studies demonstrating poor outcomes related to prehospital-attempted endotracheal intubation (ETI), both training and skill level of the provider are usually often low. Research supports a relationship between the number of intubation experiences and ETI success. National standards for certification of emergency medicine provider are in general too low to guarantee good success rate in emergency airway management by paramedics and physicians. Some paramedic training programs require more intense airway training above the national standard and some EMS systems in Europe staff their system with anesthesia providers instead. ETI remains the cornerstone of definitive prehospital airway management, However, ETI is not without risk and outcomes data remains controversial. Many systems may benefit from more input and guidance by the anesthesia department, which have higher volumes of airway management procedures and extensive training and experience not just with training of airway management but also with different airway management techniques and adjuncts. La manoeuvre de Sellick, si classique, n'est plus recommandée ou du moins il est considéré qu'elle ne dispose plus d'assez d'arguments pour en faire une manoeuvre obligatoire. Maîtrise de la coniotomie en environnement austère: Une nécessité.
" Although cricothyrotomy is becoming less common as other alternative airway devices are introduced, such as the laryngeal mask airway, King LT-D (King Systems Corp, Noblesville, IN), and other supraglottic devices, there is, and likely always will be, a role for cricothy- rotomy in a subsection of patients with difficult airways, especially in environments in which such devices are unlikely to be available. A common emergency medicine aphorism is: “If you do one cricothyrotomy, you’re a hero; if you do two, work on your airway skills.” True perhaps in a hospital, but in an austere environment many factors besides failed ET intubation lead to early cricothyrotomy. Wilderness providers must be not only technically skilled, but also adequately trained to recognize the key indications and situational decision triggers for cricothyrotomy that differ from in-hospital practice."